These days I order off the senior menu, but I was in my early 30s when I made my first journey to Alaska. I immediately realized that had I made the trip when I was 20, there’s no way I would have returned home. As a young single man, I could have easily found work and started a life in paradise. A dozen years later, it was too late. A full-time job, a family, a mortgage and all the other trappings of life had firmly rooted themselves. That effectively prohibited anything more than a foray north from my home in Everett, Washington, to enjoy the one endeavor I look forward to each and every year: spending time in wild country pursuing my favorite passion. 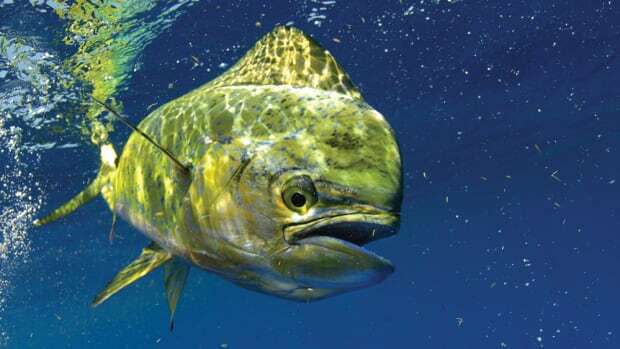 If you’re like the majority of anglers who have dreamed of taking a special trip to some of the greatest fishing on the planet, there are so many variables to consider that I thought some guidance might be in order. I have made many trips to coastal British Columbia and the southeastern part of Alaska. Both have their unique charms, and both can provide spectacular angling experiences. 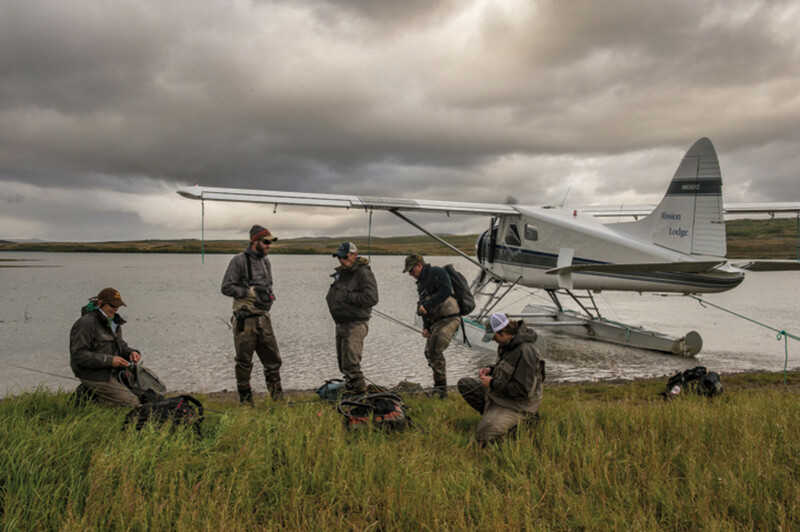 Fly-in anglers out of Mission Lodge prepare for a day on a river in Katmai National Park in the Bristol Bay region. Let’s be real — a serious fishing trip to Alaska or British Columbia is an expensive proposition. You basically have three elements of expense to consider. The first is your charter, guide or lodge fee. Second is the cost of travel, such as airlines and possibly hotels, and third is gratuities. And you need to plan separately for each of these. Remoteness is probably the No. 1 consideration when it comes to expense. The more remote the destination, the better the fishing due to the absence of human interference. This also means outfitters incur greater operating costs, as seasons are short and providing creature comforts in the wild is an expensive endeavor. Virtually everything must be flown and/or ferried in and out by boat. 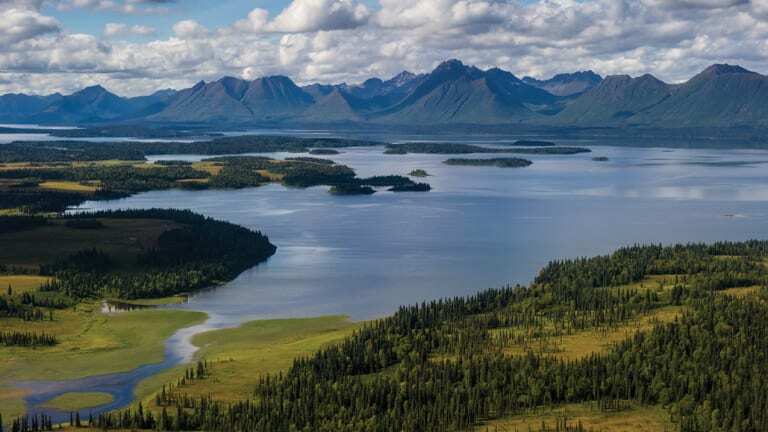 The Bristol Bay region of southwest Alaska is a remote — and expensive — place to pursue your dream. If you can afford it, it gets no better. If you can’t, fear not. 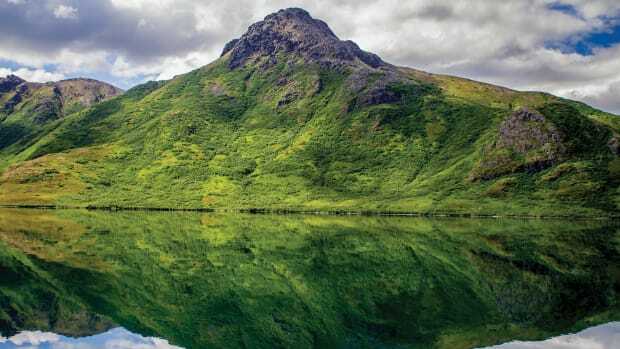 There are plenty of places on the eastern side of the Gulf of Alaska and south that won’t break the bank, but you’ll still have to part with some coin. In planning your trip, the first expense is paying the deposit; most outfitters require one. Every outfit does it differently, but usually a deposit of about 50 percent will be required shortly after booking to secure your dates, with additional payments due at several points before your trip. These deposits often become non-refundable to protect the outfitter in the event you have to cancel late, which leaves little or no time to rebook your spot. Be sure to read the fine print. The final balance can be due prior to or upon your arrival/departure. Again, understand when your fees are due and don’t miss those deadlines. You’ll pay your travel fees next. Airfare must be paid when booking flights, but most hotel rooms need only be reserved. 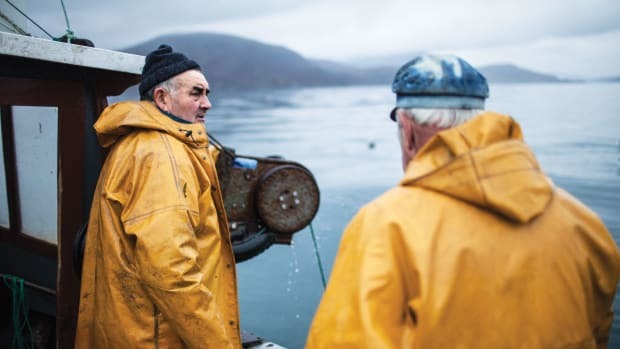 It’s very important to book flights as soon as you secure your fishing dates, as seats to remote locations sell well in advance, especially for the summer fishing season. Using air miles or credit-card-rewards programs can save you money on major flights, but these won’t work on secondary flights to specific locations, which usually must be booked separately. A bush flight might be included in your package fee, so check the details carefully while doing your research. Most outfitters have travel information on their websites and spell out what is in the package fee, as well as the time frame you must work within. 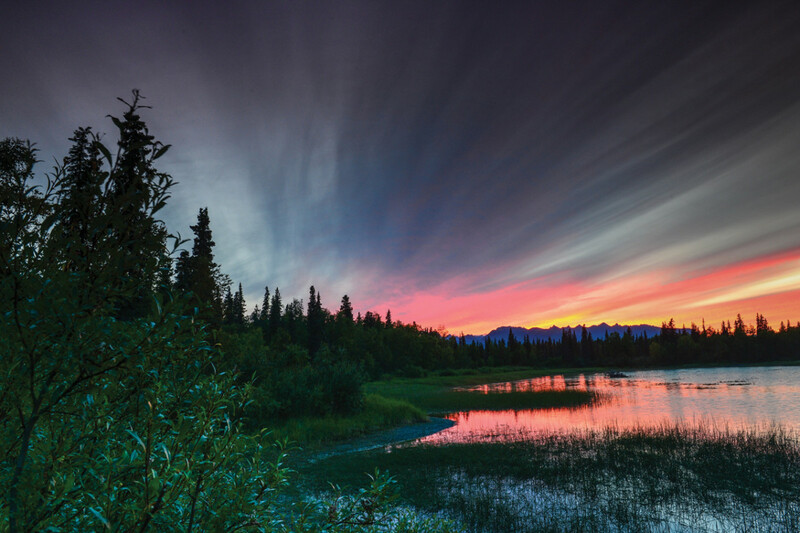 If you’re traveling from outside the West, you can usually fly to Anchorage via Seattle in a day’s time and overnight there. If British Columbia is your destination, flying direct to Vancouver might be your best option. British Columbia fishing destinations usually can be reached by one proprietary flight from Vancouver Airport’s South Terminal, from which most of the small airlines servicing the fishing industry operate. Kenmore Air in Seattle, a local seaplane operation, also flies directly to most British Columbia lodges from its base at the north end of Lake Washington and can be a great travel resource, as well. You may still need a boat ride or shuttle once you arrive at your town or village, but that is almost always in the package. The flight from Vancouver might also be included and will likely be reflected in the outfitter’s overall package fee. I’m sure you know that traveling to British Columbia requires a passport and a pass through Customs when you arrive, but what you might not know is that the currency exchange rate can save you big money on package fees. As I write this, the U.S. dollar is much stronger than the Canadian dollar, so package rates quoted in Canadian funds are much cheaper when paying in U.S. dollars. Always confirm rates with the lodge before booking, and use your credit card to ensure savings, as the card issuer will automatically convert the best exchange rate for you. Guide Chaad McBride with a nice rainbow from the Kulik River. Lastly, you will have gratuities. 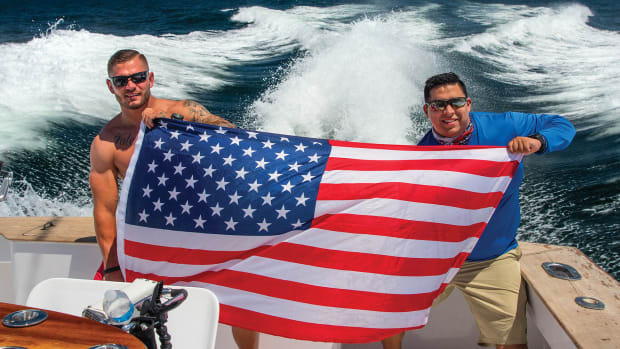 It is common courtesy in the sportfishing industry to pay gratuities, and you should expect to tip guides, the cook, the deckhand, the fish processor and the person who cleans your room. Tipping at the end of your stay is most common, and I do so with cold, hard cash. I prefer to tip people individually and express my personal gratitude for their hard work. It is also common to leave a communal gratuity with the manager to be shared equally among the crew, but my method allows for more discretion if someone stands out and deserves a larger bonus. Gratuities are personal, so the amount is up to you, but don’t be cheap. These folks give up their summers to provide service to those of us living the dream, so be appreciative. If you are unsure about how much to tip, the outfitters can give you guidance and will appreciate that you asked. Don’t be the guy who fails to be considerate. 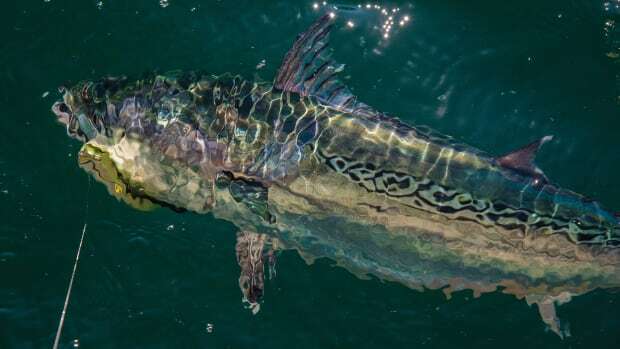 The Pacific fisheries for salmon and halibut are roughly the same in British Columbia and Alaska along a huge, shared stretch of coast that serves as a superhighway for all of the region’s species of salmon. I have enjoyed great salmon and halibut fishing from Vancouver Island to Prince William Sound and most points in between, with catch rates varying little among destinations. Daily catch and possession limits, however, differ by area. For accommodations, I have experienced everything from fancy high-end lodges to small family-run operations, and both have their appeal. The biggest difference between them is that one might offer Cornish game hens on a bed of cauliflower puree for lunch, and the other may serve ham sandwiches with a bag of chips. Evenings will be a little more cosmopolitan at luxury lodges, with hors d’oeuvres created by some culinary superstar, but a comfortable bed, adequate sustenance and great company is all I ask for on destination fishing trips. Small family-owned operations absolutely provide that, usually in a more intimate way. 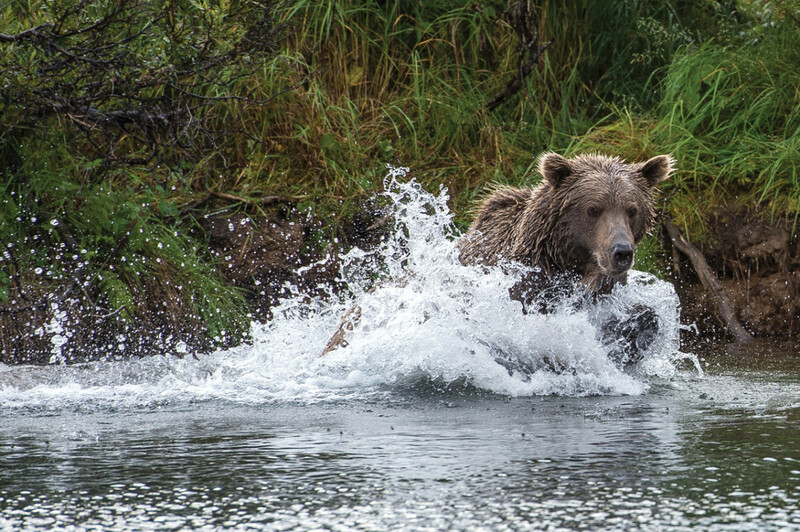 Bears and salmon, close at hand. You might also consider hiring an independent guide for four to five days, as I did in Michigan while pursuing steelhead. Rent a car, stay in a local hotel and dine at whatever restaurant in town sounds good each night. You’ll save money forgoing the pomp and circumstance without sacrificing the real rewards. Remember this: The fishing can be just as good whether you go high end, low end or somewhere in between. Once you’re on the water, everything equals out. That big halibut couldn’t care less where you’re staying or what type of boat a tasty chunk of salmon belly is dangling from. Timing is your single most important consideration when planning your trip. Play the odds and plan for the peak time for the species and location you choose. Being in the right place at the right time can produce epic results and memories. Being in the wrong place at the right time can be equally impressive. Being in either place at the wrong time can leave you scratching your head and second-guessing everything from your guide to your decision to forgo an extra pair of socks that morning. And although you can do all the research in the world, the weather plays a big role in the fish showing up a week early, two weeks late or right on schedule. Weather is the biggest culprit in creating challenges, and a big, untimely event can be a factor in your success — or lack thereof. Fishing the ocean is susceptible to wind and sea conditions, so you may not always be able to get out. 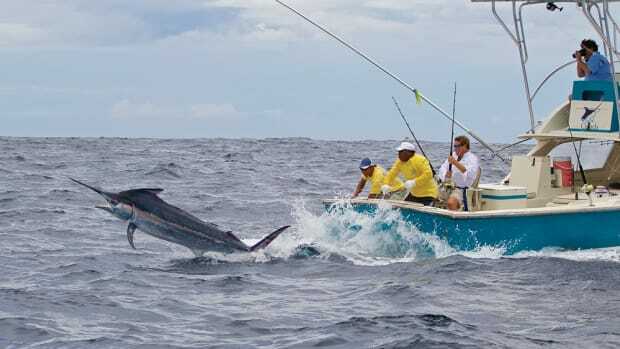 Make sure your outfitter offers other options, such as fishing protected waters on days when ocean conditions are not ideal. Rivers may be high and dirty, low and clear, or if the stars align, simply perfect. Just carry on with a good attitude, regardless of the conditions. Alaska and British Columbia can provide world-class fishing, and my most concrete advice is to keep your expectations in check and stay positive, regardless of the situation. If you head out thinking you are paying for guaranteed world-class success, you are setting yourself up for what could be a big disappointment. There are only so many things any outfitter can control. With reasonable expectations, you won’t be terribly disappointed if things don’t go quite as planned. If your timing is good and conditions are favorable, you will likely be richly rewarded with plenty of memories. I have only had two trips to northern destinations (for freshwater chinook) turn out to be challenging. Weather played a huge part each time, as did our attitudes. On one trip, local flooding nearly did us in, and on the other it was the opposite — bright, sunny days with low, clear water. Both tours were OK in the end, thanks to our expectations and staying positive. A good outfitter stays optimistic in the toughest situations; you must to do the same. 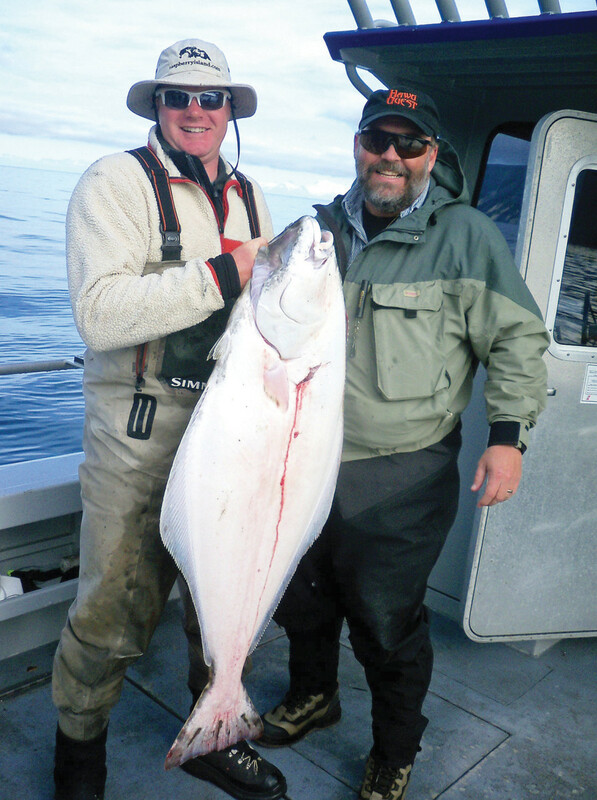 Author Kris Olsen (right) with a Kodiak Island halibut. Virtually every other trip I have made to British Columbia or Alaska over the last 20 years has delivered as promised and left me with strong memories. I have fished many notable locations, including Vancouver Island, Kodiak Island and the Queen Charlotte Islands. I have fished most of southeast Alaska for salmon and steelhead, and much of the British Columbia coast, as well. I have fly-fished for coho, trolled/mooched for big chinook, pursued wild steelhead and jigged for halibut. I took two tugboat trips, where clients live on board for a week and use skiffs to self-guide their fishing adventures. Those are voyages I’ll never forget. To experience the splendor of a wild coast surrounded by sea life is instantly liberating, allowing the soul to recuperate from the daily grind. Salmon or halibut — or both? Of course, you have to decide what type of fishing you want to do, as there are so many options. If it’s saltwater fishing, what is your target — salmon, halibut, both? 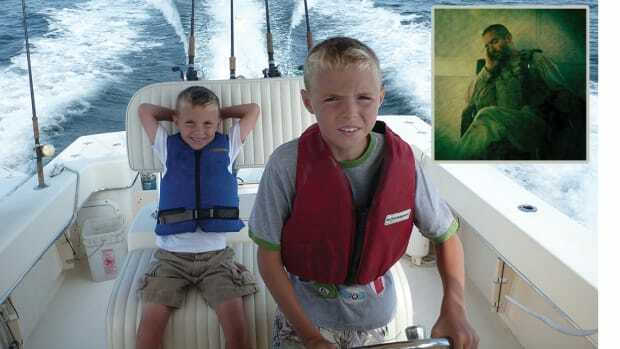 Do you want to fish from a charter boat, or are you a do-it-yourself angler? If chartering, how big a boat should you book? Do you want the boat for just one group, or do you mind fishing with people you don’t know? 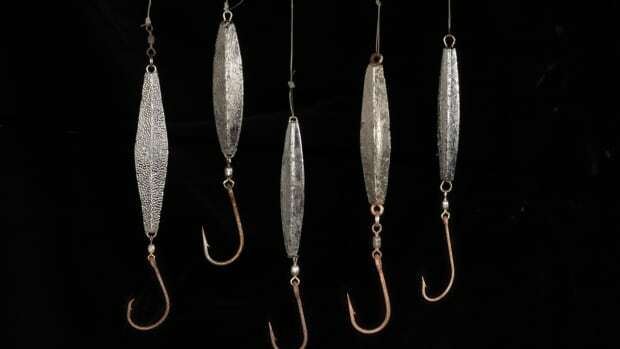 If freshwater fishing is your thing, there are similar considerations. 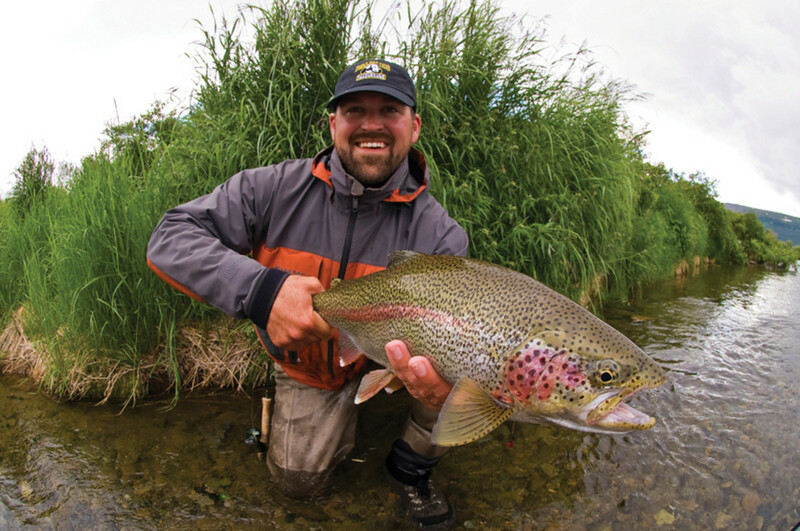 Are you strictly a fly fisherman? What is your target species? Do you want to float down a river in a raft for a week, camping along the way, or simply hike and wade a local stream? Do you want to jetboat up and down a river? Are you interested in catch-and-release fishing, or do you plan to harvest fish for home? Does your outfitter provide gear or do you have to bring your own? Perhaps you prefer the all-inclusive lodge experience, with everything provided. Determine whether your adventure is best served by including a group of friends or just one other person. I have taken a few of these trips solo, but the majority have been with one fishing partner. On a recent trip to Cordova, Alaska, to fly-fish for coho, I was joined by four good friends. In the fall of 2002, just before my son turned 15, we visited Olga Bay at the southern end of Kodiak Island. We spent a week in total seclusion doing battle with countless coho. Of all my travels, that might be my most treasured memory because of the bonding with my son, sharing our passion at a time just before life began getting real for him. Vivid sunset in Wood-Tikchik State Park, which has an area of roughly 1.6 million acres, about the size of Delaware. Let me conclude by suggesting these simple guidelines: When planning your first fishing adventure, do some research online for species you wish to target, and their whereabouts. Contact outfitters and ask questions, including whether they’ll give references. Search for the outfitter on YouTube. You’ll often find videos posted by guests or staff that can give you a good idea of what to expect. For your first trip, I recommend choosing an outfitter that provides an all-inclusive package for a single fee. 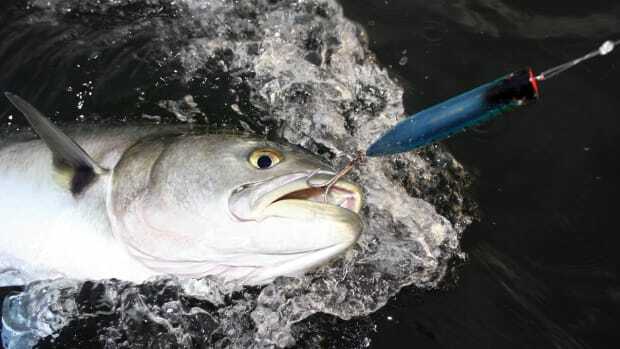 Lodging, guided fishing, equipment, rain gear and fish processing should be part of the deal. This will greatly reduce your stress level and allow you a more carefree adventure. Book your dates as much as 12 months in advance to ensure hitting the prime time for your targeted species. Plan carefully for expenses, and remember this: You aren’t truly done having fun until you’ve returned to your car and paid your parking fee! Lastly, be prepared for your life to change. Once exposed to the British Columbia and Alaska fisheries, scenery and wildlife, you will become as obsessed as I have. And you’ll want to return every year. Bon voyage and keep a tight line.